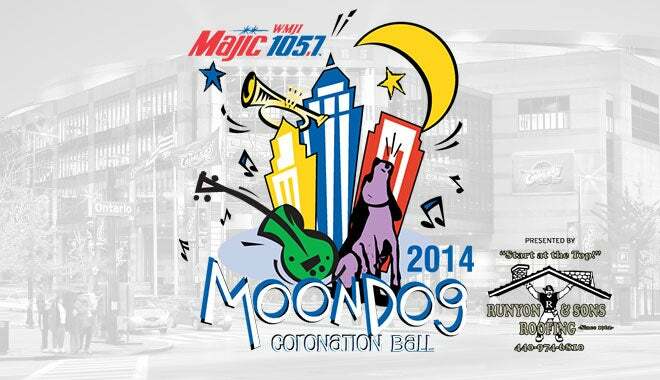 CLEVELAND, OHIO – January 24, 2014 – WMJI Majic 105.7 FM announced today it will host the 2014 Moondog Coronation Ball on Saturday, March 29th at 7:00 p.m. at Rocket Mortgage FieldHouse. This year’s event will mark the 62nd Anniversary of the original Moondog Coronation Ball held at the Cleveland Arena in 1952. Moondog 2014 will be presented by Runyon & Sons Roofing. The 2014 Moondog Coronation Ball will feature Tommy James & the Shondells, John Kay & Steppenwolf, Herman’s Hermits starring Peter Noone and The Family Stone. This year’s Moondog Coronation Ball will also include special tributes to Cleveland radio legend and longtime Majic 105.7 morning man John Lanigan. Lanigan will be retiring following the Moondog concert after almost 40 years on the Cleveland airwaves - the last 27 years of which were spent on the Lanigan & Malone show on WMJI. He was also inducted in the National Radio Hall of Fame in Chicago last November. Tickets for the Moondog Coronation Ball are $67.75, $52.75 and $37.75, and go on sale Friday, January 31 at 10:00 a.m. at Rocket Mortgage FieldHouse Box Office, online, charge-by-phone at 888-894-9424 and all northern Ohio Discount Drug Marts. The music of Tommy James & the Shondells is heard continuously, every day, in every country in the world: on radio, television or a film soundtrack. To date, he's sold over 100 million records and has been awarded 23 gold singles plus nine gold and platinum albums. Today, Tommy’s career is still in high gear. With the signing of a new distribution deal with Allegro, his entire recorded catalog is now available around the world. Airplay on terrestrial, satellite, and internet outlets is strong: a fact acknowledged by BMI this year when it presented Tommy with five "Million Air" awards for 22 million plays of his songs. On the road, he and his Shondells are still rockin’, performing their many timeless hits to sellout crowds across the country. When not on the road, Tommy continues to craft new music geared toward film and television, and develop new business opportunities for his company Aura Entertainment Group. Herman’s Hermits starring Peter Noone currently perform more than 200 concerts a year to admirers that span generations. With such classic hits that include “I’m Into Something Good”, “Mrs. Brown, you’ve Got A Lovely Daughter”, “I’m Henry VIII, I Am”, “Silhouettes” and “Just A Little Bit Better,” it’s no surprise that Herman’s Hermits have sold more than fifty-two million recordings. Today’s teen girls scream just as passionately as their mothers did back in 1965, prompting VH1 to select Noone as their viewer’s choice for the “Sexiest Artist of the Year.” There is no doubt that Peter Noone’s extraordinary talent, disarming wit, handsome features and compelling stage presence will continue to delight fans of all ages, for a long, long time to come. The Family Stone original Founding members Jerry Martini, Cynthia Robinson, and Greg Errico are Rock & Roll Hall of Fame inductees, and R&B Pioneer Award Winners. Keeping the legacy true to its original sound and raw funk groove, The Family Stone will present a set of their classic hits, such as "I Want to Take You Higher,” “Everyday People," “Thank You Falettinme Be Mice Elf Agin," "Dance To The Music," "Hot Fun In The Summertime," "Family Affair,” "Sing a Simple Song" and many more.